"find that the maximum variations of [the Sun's specific potential energy storage] correspond remarkably well with the occurrences of well-documented Grand Minima (GM) solar events throughout the available proxy solar magnetic activity records for the past 1000 yr."
The paper finds "Grand Minima are related to the Sun's closest approaches to the barycenter," and predicts another Grand Minimum in solar activity will occur around 2150 AD. Several other researchers have linked changes in solar activity to the Sun's orbital position relative to the barycenter of the solar system, which along with multiple solar amplification mechanisms may possibly one day lead to a "unified grand theory of Earth's climate." A physical model of Sun–Planets Interaction is described. There are several candidate GM events in the next 1000 yr.
We numerically integrate the Sun’s orbital movement around the barycenter of the solar system under the persistent perturbation of the planets from the epoch J2000.0, backward for about one millennium, and forward for another millennium to 3000 AD. Under the Sun–Planets Interaction (SPI) framework and interpretation of Wolff and Patrone (2010), we calculated the corresponding variations of the most important storage of the specific potential energy (PE) within the Sun that could be released by the exchanges between two rotating, fluid-mass elements that conserve its angular momentum. This energy comes about as a result of the roto-translational dynamics of the cell around the solar system barycenter. 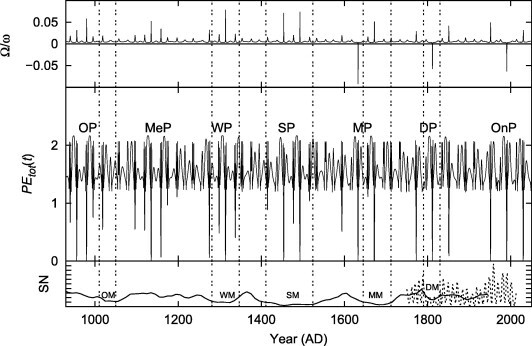 We find that the maximum variations of this PE storage correspond remarkably well with the occurrences of well-documented Grand Minima (GM) solar events throughout the available proxy solar magnetic activity records for the past 1000 yr. It is also clear that the maximum changes in PE precede the GM events in that we can identify precursor warnings to the imminent weakening of solar activity for an extended period. 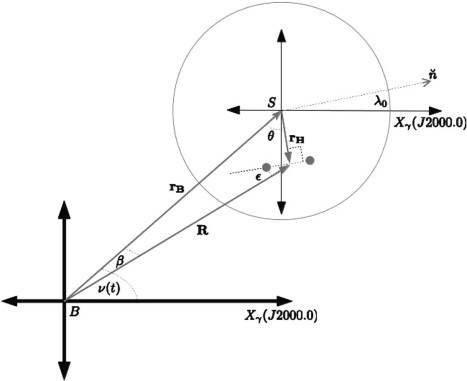 The dynamical explanation of these PE minima is connected to the minima of the Sun’s position relative to the barycenter as well as the significant amount of time the Sun’s inertial motion revolving near and close to the barycenter. We presented our calculation of PE forward by another 1000 yr until 3000 AD. If the assumption of the solar activity minima corresponding to PE minima is correct, then we can identify quite a few significant future solar activity Grand Minima events with a clustering of PE minima pulses starting at around 2150 AD, 2310 AD, 2500 AD, 2700 AD and 2850 AD. This reminds me so much of Carl Landscheidt's work in the late 80s and 90s. Now, there was a much unappreciated genius. Actually this paper is backing up Carl Smith's graph that he displayed on his Landcheidt website, the planet positions are quite different to Landcheidt's theory, this being the major reason his work didnt prove to be correct. Ehh, why don't you surf over to Geoff's place and have a look?